In before centuries, it was common for a book to have a lavishly illustrated cover which, through signs and symbols, told the prospective reader what the book is about. 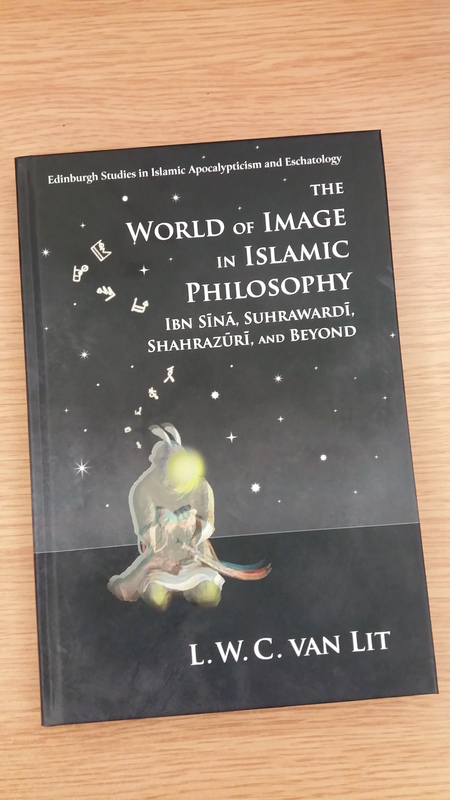 For my new book, The World of Image in Islamic Philosophy (publisher link, Amazon link), I discussed with EUP how we could do something similar. This resulted in the following cover illustration. The text elements speak for themselves: this is an academic book about a topic from Islamic eschatology. I do not discuss a flowery description of what to expect after death, but rather what philosophers thought of it. My book is essentially a description and analysis of how a novel idea, dubbed ‘the world of image’ (ʿālam al-mithāl), was first conceived, then developed, and later received. The main protagonist in this is the twelfth-century Suhrawardī. He reinvented philosophy practically from the ground up, taking not ‘existence’ but ‘light’ as his fundamental concept. The stars on this cover represent the intelligible world, the immaterial, immovable world closest to God (who Suhrawardī calls “the light of lights”). That Suhrawardī’s face is radiant symbolizes his fundamental desire: to become a light himself and take part in the intelligible world. While alive this cannot be fully realized, as his attachment to his body keeps him firmly in the earthly world of generation and corruption. Practice makes perfect, though, and Suhrawardī argues that we can come closer to the intelligible by subduing the senses. The ultimate subduing is of course death, but until then sleep and meditation provide powerful gateways. Thus, Suhrawardī is meditating, and he does so at night as this makes both sight and hearing (the two main faculties) easier to subdue. Water slips through his hands, which represents both the cleansing of the self of carnal desires, as well as the seeping of the soul through the cracks of the material world. In his meditation, mysterious symbols rise up, emanating from him. They represent the medium in between the material and the intelligible world: the world of image, in which everything is a symbol. I drew these shapes based on what I found in manuscripts of Suhrawardī’s text al-Mashāriʿ wa-l-muṭāraḥāt. In that text, in the introduction, Suhrawardī says that these symbols are the essence of his philosophy, which only a member of his inner circle will understand (for more see here). Perhaps what he means is that one needs to meditate according to the instructions and based on the philosophy of him, in order to enter the world of image and come to understand the meaning of these symbols. The sword, finally, is something people have been quick to point out. It is not meant to represent violence, but should merely be taken as a sign of the radical commitment necessary for this philosophy to be successful. I have been working on visual representations of my topic before, most notably in the form of a video. The cover of my book, however, is the best so far. Don’t judge a book by its cover, they say. In my case, please go ahead and do so!